I am grateful to Cardinal Kasper. Indeed, I’ve long had a particular respect for him because I often attended daily Mass that he reverently offered at Santa Maria in Trastevere, a beautiful ancient Roman church with a vibrant parish community. He was usually assisted by seminarians and he was consistently emphatic in his teaching and formation of the seminarians even during the Mass. That made a lasting impression on me. I saw that he was a priest who took the sacrifice of the Mass very seriously. Later, I learned that we might not see eye to eye on some issues. Well, it is the Catholic Church and there’s not always a whole lot of agreement under our big tent. Yet, we’re all Catholic and there’s something to be said for that. In February, when the Cardinal addressed the extraordinary consistory in preparation for the Synod, he raised a very important pastoral issue (though by no means the only one): the admittance of the divorced and remarried to the reception of the Eucharist. As the content of his presentation leaked out or was presented in other interviews, and finally the publication of his book, The Gospel of the Family, I found myself at odds with his solution to the problem – sort of a via media. Simply put: find a way for some couples meeting specific criteria in irregular marital situations so that they could perhaps undergo a penitential process and then be admitted to all the sacraments, including the Eucharist. I get where he’s coming from. It’s a serious problem. But, not withstanding his scholarly expertise, his priesthood, and his ranking as a Cardinal, I did not find his solution convincing because I did not see that it took into account fully the deep tradition and theology of the Catholic Church. Nevertheless, he started a necessary conversation that could have hijacked the Synod had it been left for initial discussion until then. 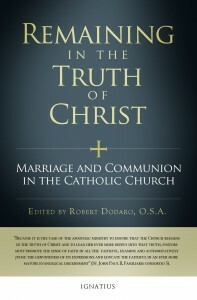 Having started what has become a dialogue of sorts has allowed time for thoughtful scholarly exchange to begin, most notably in the work of the upcoming volume Remaining in the Truth of Christ: Marriage and Communion in the Catholic Church, a collection of essays written by five Cardinals and four additional scholars responding to Cardinal Kasper’s proposal and claims. It’s very important to have accurate scholarly analysis when addressing complex and emotionally charged issues like that of the divorced and remarried. As the internet has become the dominant form of publication and exchange of ideas, some debates have been obliterated by the very forum provided by the internet: quick responses, no editing, not so much academic work and careful research. Instead it turns into a rapid fire response that does not allow time for the true work of academia: seeking and discovering truth. It just becomes a way for more people to stay fixed in their opinions, something more in line with the tenor of cable news shows. That said, I’m not betting that Cardinal Kasper’s opinion will change simply because of this volume. But I eagerly await his response so that the exchange can continue so that we can better understand our faith. Remaining in the Truth of Christ includes historical analysis, Scriptural exegesis, theological study, and canonical analysis, all of it very carefully researched and presented. In order to know where we’re going, we’ve got to know where we’re coming from. We have to know what exactly the Church has done, thought, and promulgated over 2,000 years. Does the annulment process make sense when we look at it in its entire context or not? 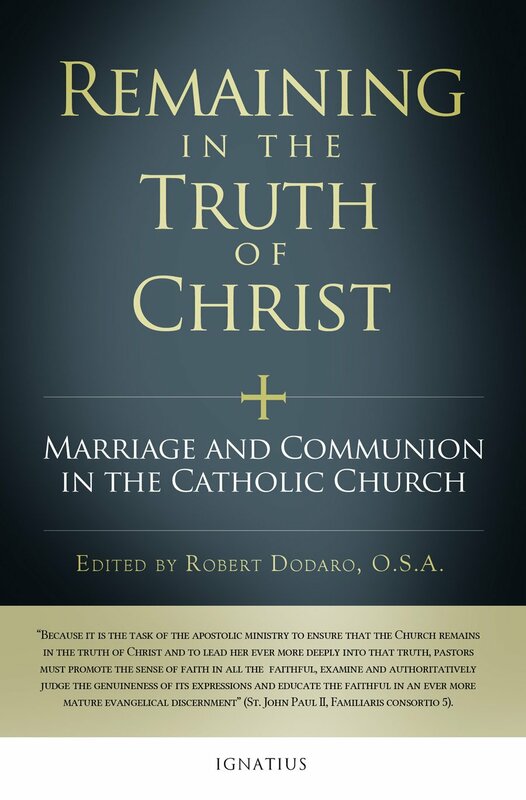 I think this will be a foundational book for anyone, scholar or not, interested in the questions not only of the divorced and remarried, but also marriage, the Eucharist, the role of law, the meaning of what it means to be pastoral. In many ways, it’s a great compliment to St. John Paul II’s apostolic exhortation Familiaris Consortio (1981) [the resulting document of the previous Synod on the family (1980)] and also to his Theology of the Body, along with the Catechism of the Catholic Church. Cardinal Burke’s contribution is brutally honest, putting forth serious shortcomings of various tribunals while at the same time arguing for the integrity of the annulment process. He clearly sees a need for reform, too, even if it’s not the same one that Cardinal Kasper enunciates. The historical analysis by John Rist, not to mention the overview of the various Orthodox approaches to marriage, divorce, and remarriage, by Archbishop Cyril Vasil’, SJ, provide an essential basis to any serious conversation on the topic. So far, there’s been casual mention of historical and Orthodox practices, but very little discussion and analysis of the actual practices. If we’re going to move beyond the realm of opinion and emotionalism, we have to encounter the truth face on. I don’t expect this volume to be the last word, even though each expert makes a very important contribution, and I certainly hope Cardinal Kasper responds in kind so as to keep the conversation going until we have a better grasp of the truth as the Church in her entirety. And as things begin to become better understood at the academic and hierarchical levels, they need to trickle down to pastors and other lay leaders so that every parishioner, indeed every person who comes into contact with the Church, is greeted with the truth, even when it’s difficult. I’ve always been put off by the practice of hiding or denying truths that are “too difficult.” In psychological parlance, that’s a bad form of co-dependence. I don’t like it because it doesn’t respect the dignity of the human person to think and act for herself. In some cultures, for example, the patient is not told the full extent of her illness in an effort to “protect” her. Many have noted that we are sick because of our sins and Pope Francis has called the Church “a field hospital for sinners.” And that’s precisely why I think that it’s so very important to not only arrive at the truth, but to promulgate it. A patient can’t get better or prepare for a terminal diagnosis without being fully informed. It’s my hope that this volume will be foundational in the field hospital that is our Church. It’s also my hope that Cardinal Kasper and others who agree with his thinking will respond for the sake of the pursuit of truth. After all, as Christians we believe that Christ is the only means of obtaining eternal health and well being: “I am the way, the truth, and the life.” (John 14,6). We cannot follow Christ or live as Christ if we do not have the truth. If you’re interested in the truth and want to inform yourself about a debate that will surely continue beyond this Synod and onto the next in 2015, pre-order Remaining in the Truth of Christ. Read it and study for yourself and for all those in your life who will also be asking questions related to the topic at hand. You might also enjoy my recent post on how Pope Francis may have organized a pre-Synod, sort of a release valve, to make the upcoming Synod more effective and focused. Pia de Solenni is a moral theologian and cultural analyst. Her dissertation was recognized by St. John Paul II in 2001.